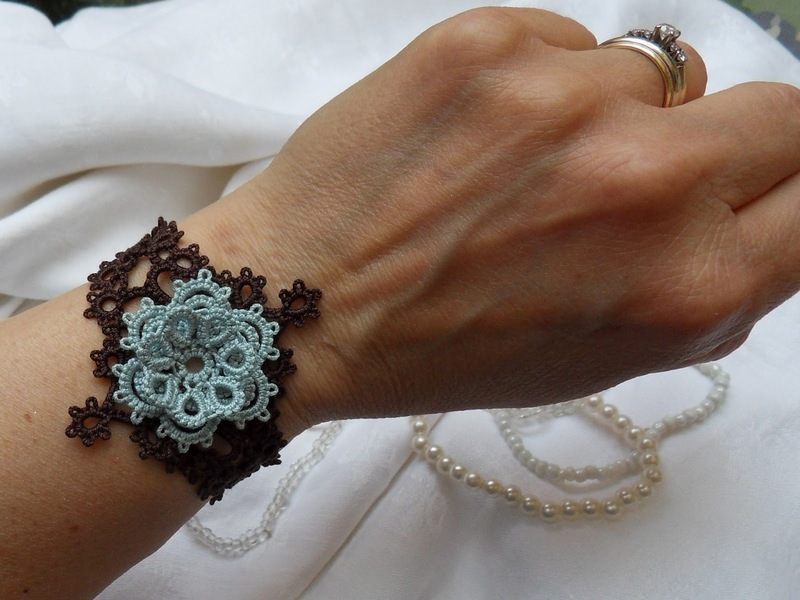 This is TotusMel's Corsage bracelet which she has recently made available on Instructables. It appealed to me straight away so I had to set to and make it. I have very few size 10 colours (Lizbeth 10 is not available here in the UK) so out of the six colours I had, I chose one of my favourite blues (Country Turquoise Light) and paired it with Fudge (it probably looks black in the photos but it is a very dark brown). First of all, what I found out is that TotusMel's needle tatting works out quite a lot bigger than my shuttle tatting: the bracelet was much too short (though I don't have a particularly large wrist) and there was some tension between the elements (luckily nothing that couldn't be fixed with a light pressing). So then I needed to fix the length and didn't want to take it all apart or start again (my size 10 is precious, I don't wan't to waste any!). So I just tatted another "end piece" with an extra button. I also felt I wanted the flower to be a bit more three-dimensional so I tatted an additional centre piece and with the right stitch count, made it so that it stands up a bit. ended up matching the funky manicure I'm currently sporting! I'm pleased with it, it's a lovely pattern (thank you TotusMel!) 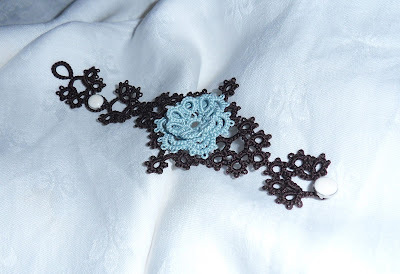 and will wear it but with my shuttle tatting, I would have to amend the pattern a bit if I was to make it again. Has anyone else tried it? And just in case you haven't seen it, please do take a look at the previous post (I should have waited longer before posting again so more people got to see it, but as usual I was impatient to share what I'd been up to) - Marie Smith's Split Chain Method - Really Worth a Look, don't miss it! Just scroll down, it's the post below. Lovely, lovely! Looks good on your wrist. It really looks wonderful- I like how you added more to the flower to get more dimension to the piece. I was thinking how it would be a lovely thing for prom. My grandpa always gave my grandma a corsage for Mother's Day. Maybe I'll make myself one! And your manicure is fantastic- I was admiring it on the split chain video. Beautiful work! I don't have any size 10, but I have contemplated dyeing it. Your nails are so lovely! I love those colors together! Your video was wonderful. I haven't tried the method yet, but it look like something I could actually do. Thank you so much for posting it! I was just looking at that pattern yesterday. Looks a lovely bracelet, I will go and check out the pattern, I only told my grand daughter to look at your blog last night, she is a beginner and although she had heard of a split ring she had not seen a split chain. The bracelet is very pretty. 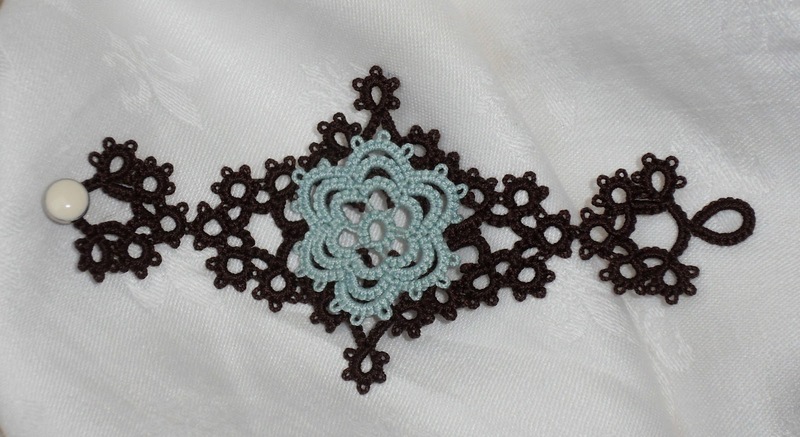 I did see the pattern on TotusMel's blog, but didn't think of tatting it because I know she does needle tatting. Some adjustments needed, but I'm interested to see it is possible with shuttle tatting. Great video. I have to confess that this is the only way I know of doing a split chain, after reading Marie's way on Jane Eborall's blog. Very clever improvisation on the bracelet. I only know how to make basic rings and chains in needle tatting. I made a sample ring with needle and another with shuttle, and the needle-tatted ring definitely is bigger than the tatted one. I made this pattern too and I love it. I made it with a needle and it is a little wide for me, I will change the connection between the three parts (it is a bit fragile and thin, I think, it turns a bit too easy). I love your dimensional flower and the colors you used. Love the way you added length to the bracelet.....I have made two so far for gifts and I added length to one with just adding rings on each side of the end pieces but your solution looks very nice. Did you find that certain parts of the pattern were not symmetrical? Did you work it exactly as written in that case or did you adjust for that? Hi Chloe, no, you are right, I did find that it was not symmetrical (one one side she would attach to the first picot of the ring and coming down the other side, she would attach to the second picot - or something like that). I did end up doing this one as was written but now I've done it once and know where everything should be, I would make the joins symmetrical if I were to make it again. How did yours turn out? Well, like you, I shuttle tat so it came out small. I tried to correct for the lack of symmetry on the fly and found it frustrating. I was really beginning to wonder if I was just reading it wrong. It is almost finished but I'm discouraged. I may start over and make the back first and attach the flower last. Yes, I agree it was a little frustrating and didn't completely make sense in places. I also found that, shuttle-tatted, there was too much tension between the elements and rings were on top of each other which I don't like. I don't want to be too critical as I realise it would probably come out quite differently if tatted on a needle. But would need amendments for the shuttle I think. It turned out beautifully, Frivole! You made a good adjustment and it looks just fine. It's funny that now I am working on a shuttle pattern, Linda Davies' Double Fuchsia, and it is turning out much different than I expected because I am needle tatting, I presume. I will see it through and then see what stitches to take out for my second go!